It’s Valentine’s day and love is in the air, so feeling a little heady is the order of the day! Despite decades behind me, the quest to understand this emotion only gets stronger (the assumption being, I haven’t quite understood it completely!). Just what is this love that makes mountains move? Well, if this seems a trifle clichéd and juvenile (isn’t the god of love a child? ), then so be it; let me indulge in some juvenile romantic quest, if I may! isn’t in it, just doesn’t exist. While love is capable of many things, I am quite impressed by its ability to transform as well as avenge. Let me give you a beautiful example of love transforming. The King of Mandukya’s daughter, Sushobhana, didn’t want to get married, as she felt that marriage was like caging a free bird. She wanted to be free and spend her life philandering away to glory. 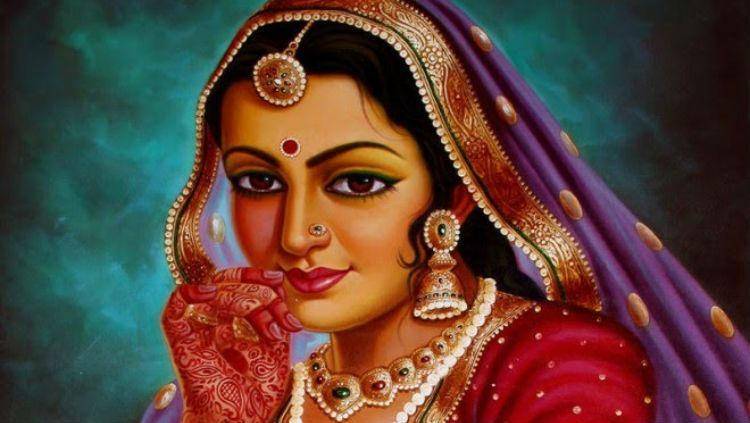 Sushobhana would mask her identity, and get close to the man of her choice and live with him till she got tired of him, and leave under some pretext, which she would have worked out before getting into the relationship. The men would be under a vow never to speak about it and thus no one knew, except her maid Subinita and the King himself. Subinita on her part tried her best to stop the princess from such philandering, but Sushobhana never yielded to her requests and used her beauty and charm as a means to live a life of her choice. Related reading: Does living-in together mean you are ready for marriage? Once, Sushobhana met the handsome King Parikshit of the Ikshvaku dynasty. Sushobhana was impressed by his looks and lured him into a relationship. Soon Parikshit took the unknown lady to his palace and the two enjoyed themselves. A time came when Parikshit wanted to marry her, but Sushobhana, true to her nature, saw that as an entrapment. At the beginning of the relationship, she had made Parikshit take a vow that he would never take her near a water body. Over a period of time, Parikshit had forgotten about it. 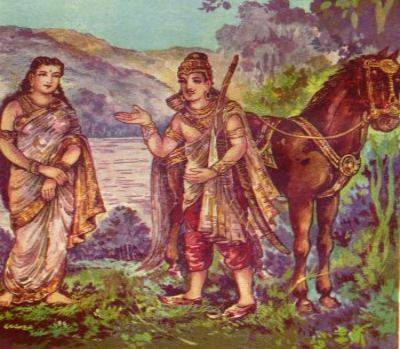 When Sushobhana came to know about the wedding, in a moment of Parikshit’s weakness, she made him take her close to a lake and on reaching the lake, she reminded him of his vow and her imminent departure. When a shocked Parikshit wanted to know the cause of the departure, she feigned a curse. At that moment Parikshit decided to hold her in a tight embrace, daring the curse to take effect. It was at that moment, that Sushobhana felt that this man was different, and something inside her changed, but she could not accept that this was love. She managed to escape from there. While she was leaving, Parikshit noticed a spy and from his dressing, realised that he was from the Mandukya kingdom. He took his army to the doors of Mandukya and asked them to hand over Sushobhana who he thought had been ‘kidnapped’ by them. The King met Parikshit and told him the whole story of his daughter’s reluctance to marry and her philandering nature. When Sushobhana came to know about it, she was depressed that her truth was out in the open and the shame would be too much for her or her father. At that moment she decided to commit suicide. Just when she was about to gulp down the cup of poison, her maid Subinita comes to tell her that Parikshit was waiting for her in his tent. Sushobhana was surprised to know that the prince wanted to accept him even after he knew everything. Why would any man want a woman whose ways were wanton and who wilfully led a life of the unspeakable? Subinita replied, “For love”. For the first time Sushobhana realised the power of love and inside her grew the desire to belong. For the first time she wanted to fly and be caged in the arms of Parikshit. To the joy of everybody, love had transformed a wayward philandering woman. The same epic also tells us about how love makes one avenge for the love of one’s life. The Mahabharata has always referred to the love of Draupadi for Arjun. What has been overlooked is the love of Bhima for Draupadi. Though Bhima was married to Hidimbi the demoness before Draupadi, it was Draupadi that he deeply loved and never missed an opportunity to express it. An obvious example of it is his fetching of the Saugandhika flower after a great fight with a demon. However, a more pertinent example of coming to her aid was that of saving her from Keechak during the year of exile. The thirteenth year of exile was in disguise and the Pandavas were at the court of Virata. When Keechak, the brother of the Queen of Virata tried to molest Draupadi who was serving the queen, Draupadi turned to Bhima to save her. At the risk of their disguise being recognised, Bhima killed Keechak, as he could never bear to see anybody insult her, even though Yudhishtir kept quiet as the King’s assistant. Another example was during the disrobing of Draupadi in the court of Dhritarashtra. It was only Bhima who reacted while the others simply expressed their inability to do anything. It was Bhima who vowed that he would break the thigh of Duryodhan for asking Draupadi to sit on his lap and would drink the blood of Dushashan for touching Draupadi. True to his words, he killed Duryadhan by fatally striking him on his thigh. Prior to that he ripped open the bowels of Dushashan and with the blood he washed Draupadi’s hair, which was left loose since the day of the disrobing, before binding it. While this might seem gory, nonetheless it is an expression of Bhima’s love and affection for Draupadi, who too knew that Bhima was the only one she could turn to in times of distress. Many would term this to be one-sided love, but then who cares about sides, when love has been expressed to avenge the insult for the person one loves? 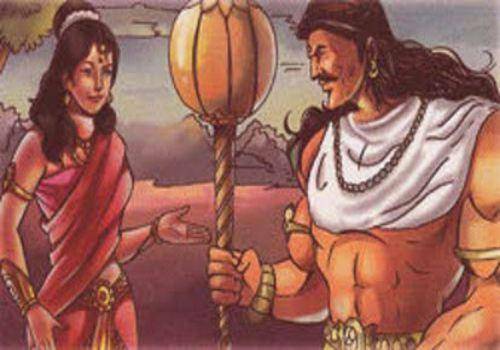 Bhima’s love for Draupadi comes from an unadulterated origin. He loved her, because he loved her. And that’s what he always did. Relentlessly. Even without any expectation of return. Mahabharata is one of the most profound and powerful epic of the millennium. The significance of it is vast that words fail miserably to depict it. And when it comes to love, Mahabharata has brought myriad dimensions of love before us. Mythology has always explained emotions in such a beautiful way. Nice stories.